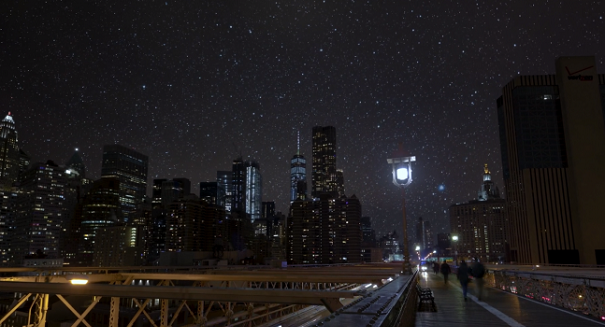 An absolutely mind blowing picture shows what the New York City sky would look like if you could see stars. When it comes to light pollution, there are not many better examples than the “City that Never Sleeps,” New York City. People who live there hardly even know what the stars look like because there is so much artificial light all around them. That is why this amazing picture above is so extraordinary. It is a depiction of what the night sky would look like over New York if there were no light pollution. The illustration was created by the Skylow project, which aims to show how New York and other big cities might look like if there was not so much light pollution all around them. Skyglow released a new video to promote “Dark Sky Week” from April 15 through 21. The event is spearheaded by the International Dark Sky Association and aims to show the problems that light pollution create around the globe, from high energy costs to a reduction in the quality of life for people.